Upon booking you will receive an email with directions and what to bring on your tour. 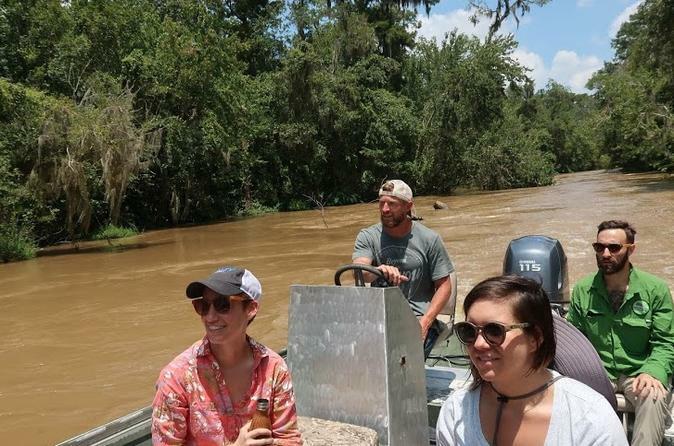 The boat tour is located 45 minutes East of New Orleans in Pearl River, LA. Transportation is not provided to the boat launch. Meet our tour captain at Honey Island Fish House, behind the bar which is at the back of the parking lot, 10 mins before your arranged departure time. Board our flatboat and enjoy a 2 hour tour of the lower Pearl River, including the Honey Island Swamp. Adults and children are the same price, since spots are limited to 6 on each tour. Children under 16 must wear a life jacket, we have 2 child size and 1 infant lifejacket available, if you are bringing more than that amount of children please bring appropriately sized life jackets.